Stone Soup Theatre’s dual production of Thornton Wilder’s “The Long Christmas Dinner” and theatrical adaptation of Dylan Thomas’ poem “A Child’s Christmas in Wales,” opened Friday night to a comfortably full audience. Preluded by “The Long Christmas Dinner,” “A Child’s Christmas in Wales” showcased several traditional Christmas songs sung by a keen group of kids and all-in-all lively cast of characters. Set in the simple but idyllic Welsh countryside, an adult Dylan reflects nostalgically on a Christmas day from his boyhood typified by the gentle familial tensions and traditions present in a classically sweet Christmas tale – argyle sweaters, mince-meat pudding, kitchen fires and snowball fights included. It’s less harrowing than “A Christmas Carol” and more to the tune of “A Christmas Story” without the suspense associated with an arc or character-defining conflict and resolution making it completely appropriate for youngsters. I was enlivened by Ben Sanders’ fully-invested and energetic carriage of young Dylan as well as his leadership of the talented youth cohort of the cast, both in acting and in song and dance. 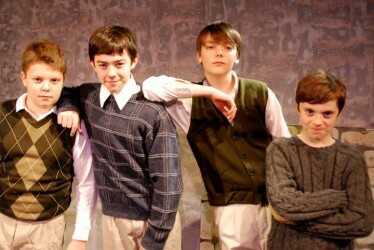 All six young actors were animated and engaging; Dylan and his childhood friends, played by brothers Bergen and Olin Sorby, and Felix Coble, sang playfully together but also with their own unique spirit during solos. Dylan’s dedicatedly tiresome girl cousins, played by Ellie Rice and Izzy Woods, made a melodious duet out of God Rest Ye Merry Gentlemen. The youth were the life of this party but the cast behind them cannot go without mention either. I was particularly entertained by Cece Klinger and Joane Burger’s memorable bit portrayals of boisterous Aunt Hannah and easygoing public servant respectively in the face of a near miss dinner disaster. Less impressive was the adaptation of “The Long Christmas Dinner,” which preceded. While the solemn approach to inevitable life change was interesting – a fluid series of Christmas dinners that take place over the span of three generations – the enactment left some to be desired. The play lacked props which I don’t understand since the set stayed the same (at a dinner table) throughout the entire one-scene production and the addition of a few simple props would not have complicated a scene change while it would have added positively to viewer experience. I was enough distracted by the actors acting out props with dishes, babies, and servants that weren’t there that I could seldom connect with the characters themselves who moved through each dinner, life stage, death and birth so quickly that I couldn’t keep up. There were significant occurrences, but the emotions attached to them, which at several points had the potential to be more poignant, hardly had a moment to marinate before the cast moved on. This might have been done to allow enough time for the play that followed afterwards, but just a few extra moments between changes and during emotional incidents could have made it much better. The premise itself was very interesting and the play was pleasant, but not moving. Though it’s good that “A Child’s Christmas in Wales” followed after, it may be the one detail that affected the performance of “The Long Christmas Dinner.” It was opening night so it very well may be that the showings adapt through this holiday season. There was less of a character-defining arc in “A Child’s Christmas in Wales” but the portrayals were more engaging than their predecessors, even with some of the same actors. Fancy that. Catch Stone Soup Theatre’s “The Long Christmas Dinner” and “A Child’s Christmas in Wales,” by Thornton Wilder and Dylan Thomas, and directed by Ray Woodall, at DownStage Theater in West Seattle. December 6 – 24. For tickets and more information visit http://www.stonesouptheatre.org.